Twins Tegan and Sara Quin, lead mem­bers of Tegan and Sara since 1995, have just released their newest full-length, Saint­hood. Their sixth LP, Saint­hood draws on a grow­ing wealth of expe­ri­ence, and clear­ly shows it. Saint­hood is short in all respects, with no track sur­pass­ing three and a half min­utes, with the entire col­lec­tion of tracks bor­der­ing on EP length. How­ev­er, Tegan and Sara uses this short­ness incred­i­bly well to curb what would oth­er­wise bor­der on bore­dom-induc­ing repet­i­tive­ness. As with most of their music, Tegan and Sara Quin share vocal duties on Saint­hood. After five albums, they’ve pol­ished their vocal inter­play to a fair­ly impres­sive degree. The best tracks of Saint­hood share the spon­tane­ity of Tegan and Sara’s ear­li­er work (espe­cial­ly “Northshore” and “Hell”) - the same slight­ly rough ener­gy that made “Walk­ing With a Ghost,” (from the sis­ters’ 4th album “So Jeal­ous”) so suc­cess­ful. On a few tracks, how­ev­er, the vocals almost approach the point of pre­dictabil­i­ty - but in the end, the Quins’ dis­tinct vocals break through. 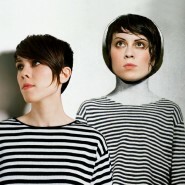 Like much of indie-pop, Tegan and Sara’s music has always relied upon rep­e­ti­tion. Saint­hood is no excep­tion, and many of its tracks cen­ter around oft-repeat­ed cho­rus­es, begin­ning with the open­ing track, “Arrow,” on which “I take my aim / You feel me com­ing close / I take my aim so you feel me com­ing close” is repeat­ed six times over three min­utes. This is gen­er­al­ly suc­cess­ful thanks to the ener­gy put into the music through vocals and instru­men­tals, though on rare occa­sions it leads to a cer­tain degree of stag­nan­cy. Among this, Saint­hood also con­tains the semi-poet­ic gems Tegan and Sara tends to include among the rep­e­ti­tion. On “Arrow,” this takes the form of ques­tions begin­ning the track: “Would you take a / Straight and nar­row / Crit­i­cal look at me? / Would you tell me tough love style? / Put judi­cial weight on me?” while on “Hell” it takes the form of word­play: “No, we’re not ready for hell / Hell no.” The fol­low­ing track, the col­or­ful “On Direct­ing,” con­tains what is per­haps the most quin­tes­sen­tial­ly Tegan and Sara-ish line of the album: “Go steady with me? / I know it turns you off when I / I get talk­ing like a teen.” Simul­ta­ne­ous­ly play­ful and amus­ing (if severe­ly over-repeat­ed) enough to be thought-pro­vok­ing - it’s an indi­ca­tor that Tegan and Sara’s cre­ativ­i­ty lives. Much like the lyrics, the instru­men­tals rely on rep­e­ti­tion, but do so quite care­ful­ly. Notice­able imme­di­ate­ly from the open­ing track, when­ev­er any line begins to shift from rep­e­ti­tion to over-rep­e­ti­tion, Tegan and Sara imme­di­ate­ly changes the line, adds a new har­mo­ny on top of it, or if all else fails, ends the track. Fur­ther­more, not only is the use of rep­e­ti­tion care­ful­ly admin­is­tered, but the band also insures that all lines are incred­i­bly well bal­anced with each oth­er. The obvi­ous exam­ple is “Hell,” which has a threat­en­ing­ly loud drum part that Tegan and Sara then con­trol through slight tone damp­en­ing. Addi­tion­al­ly, there are a num­ber of excep­tion­al points on Saint­hood that deserve spe­cif­ic men­tion. One tech­nique used spar­ing­ly but per­fect­ly on the album is the com­bi­na­tion at the end of a track (say, “Arrow”) of two of the main, con­trast­ing sec­tions pre­vi­ous­ly used, which nev­er fails to pro­vide amaz­ing har­monies and incred­i­bly inter­est­ing inter­ac­tions. It is no sur­prise, then, that one of the most impres­sive tracks on the album is “The Cure,” which uses sim­i­lar har­monies and inter­ac­tions through­out the track - although the sec­tion towards the cen­ter of the track that uses repeat­ing, build­ing descend­ing sequences to cre­ate what are quite clear­ly the best chord pro­gres­sions on the album trumps every­thing sur­round­ing it. The com­bi­na­tion of cre­ative vocals and lyrics, well-com­posed and orches­trat­ed instru­men­tals (as well as care­ful­ly man­aged length) makes Saint­hood a suc­cess­ful album. Five pre­vi­ous albums have obvi­ous­ly con­tributed to the care­ful con­struc­tion of Saint­hood - there are very few mis­steps, and the hall­marks of the duo’s music, vocal inter­play and well-con­trolled rep­e­ti­tion, are in full force. Tegan and Sara has cre­at­ed an album which man­ages to have the catchy appeal of pop with the intro­spec­tion of rock - and which is sim­ply enjoy­able over­all.